Courtney Carver's newest book, Soulful Simplicity, makes a compelling case–and offers practical tips–for clearing the clutter out of our schedules, our homes, and our minds to make space for a meaningfully productive life. In this episode, we continue our Productive Reading recurring series. In episode 133, I shared key principles from Gary Keller’s The ONE Thing. In episode 147, I talked about lessons learned from The Power of Habit, by Charles Duhigg, and in episode 166, I summarized my takeaways from three of Brené Brown's books. According to her author page on Amazon, Courtney Carver believes simplicity is the way back to love. Mom, wife, and curious creative, Courtney Carver left the advertising industry in 2011 to pursue blogging, writing, and speaking about simplicity. After being diagnosed with Multiple Sclerosis in 2006, she was determined to eliminate as much stress as possible for a happier, healthier life. The common thread in every change she made from diet to debt was simplicity. She created bemorewithless.com, minimalist fashion challenge Project 333 and the Tiny Wardrobe Tour to share her stories of living with less and connect with like-hearted people. Late last year, she was my guest on episode 169, before Soulful Simplicity released. I pre-ordered the book right after I interviewed her, then read a chapter each morning during my morning quiet routine. Soulful Simplicity is one of the best books I’ve read in recent years. I rank it up there with Essentialism and The ONE Thing as impactful books I’ll continue to re-read periodically. This book is inspiring, but also practical. Each chapter ends with action steps–things you can do to put into practice the ideas discussed in that chapter. Following is a brief summary of some of the key takeaways that stuck with me, followed by quotes from the book that resonated with me on those points. This particular section of the book was inspiring and thought-provoking for me. My house is generally clean and tidy, but we’ve been married a long time and we have 5 kids, so we have a LOT of stuff, including a lot of items that have sentimental value to me. She talks about letting go of these mementos and keeping the memories. As I read these chapters, I thought about these questions: Why do I have the stuff? Why do I keep things I don’t use? I thought back to my past and realized that so many years living with very little created a fear of lack within me. I was hanging on to things I haven’t used for years just in case I might need them. Reading Soulful Simplicty helped me realize the truth is if I need them, I could buy or borrow another one. Too much stuff weighs us down, and costs us time and opportunities because it takes time to take care of it. Take a big box through your home, putting in stuff you don’t use or care about. When it’s full, tape it up and donate it. After you’ve done this a few times, your “decluttering muscle” gets stronger. Then you can turn to the things you keep for sentimental reasons. Suggestion for sentimental items: Hide it. Put it out of sight for a while and see if you miss it. Let go of the guilt of letting go. Courtney talks in the book about her Project 333 and the way paring down her wardrobe led to greater simplicity and peace in other areas of her life. In the chapter titled “The Busy Boycott,” Courtney talks about the impact of having our schedules full and having no white space or downtime. Just as clutter in our home impacts us, clutter in our schedule and minds impacts us. I encourage you to check out her 21-day challenge to declutter and de-busy your schedule introduced in the book. Why is it important for me to be and appear busy? What happens if this never gets done? How do I want to spend my precious time? Courtney encourages us to implement a morning routine, and to use “habit stacking” to build morning routines that serve us. Shower mindfully instead of rushing through or thinking about the to-do list. Be present in the shower, and focus on the sensations of the water, soap, etc. Read one or two affirmations that are meaningful to you. Post them in your bathroom. Set intentions for the day. Think about what you listen to in the morning. Maybe instead of the news or cartoons, something uplifting such as an inspirational audiobook. If you have kids and noise, simply put on some soothing or uplifting music. Or, like Tyree Ayers (guest on episode 178), have nothing on in the background. Be present in the space without occupying your mind with other sounds. She has a chapter about Your Heart’s Mission Statement. This alone makes the book worth reading. Simply put: Courtney Carver's Soulful Simplicity is one of the best books I've read in the last couple years. I highly recommend it for anyone who's interested in making a life that matters. 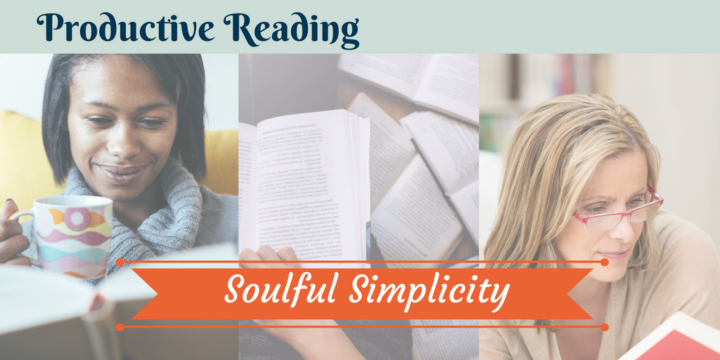 Have you read Soulful Simplicity? What spoke to you most strongly? Please share your questions or thoughts about the book and its topic in the comments section at the bottom of this post or in The Productive Woman Community Facebook group, or send me an email! FreshBooks, offering a 30-day, unrestricted free trial to The Productive Woman listeners. To claim it, visit FreshBooks.com/WOMAN and enter THE PRODUCTIVE WOMAN in their How Did You Hear About Us?” section. Making Light Candles, offering $10 off your first subscription when you visit makinglight.com and use the promo code TPW10. For support in your journey of making a life that matters, join me and a few other like-minded women in The Productive Woman mastermind. New groups will begin meeting in April. Visit the Work with Me page of the website for more information and a link to the short online application. Questions? Email me! So, so good – thank you for distilling so much helpful content!